According to the Social and Behavioral Sciences Division at Yale University, the study of social and behavioral sciences is to understand the many influences on health of a population. These influences can include psychosocial, behavioral, community and society, and also includes those who are disadvantaged. They seek to create interventions to the public health system that erase the many aspects of health and wellness that can be eliminated for all ages. With the increasing global nature of our world, the care and concern for disadvantaged individuals and populations have appeared more and more preventable. With greater access to other parts of the world, more can be done to help those who have had excessive barriers to their ability to health and wellness. Nancy Weaver, PhD, MPH at SLU discusses what Behavioral Science and Health Education is and why you should study this. The elevated nature of these global studies calls for a workforce that is highly trained and educated in the many factors that affect the social and behavioral sciences of global public health. These more sophisticated positions call for a greater proportion of educated employees with more advanced degrees and specific knowledge. A great way to prepare for these careers is to consider a graduate degree, such as the Master of Public Health in Social and Behavioral Sciences. The following information will provide an understanding of what this degree is made up of, and different ways that obtaining this education may be more achievable than previously believed. First, some examples of universities that are offering programs in this field, and even degrees that are able to be completed entirely online. West Virginia University – Master of Public Health in Social and Behavioral Sciences – This graduate degree is also offered as an online option. Primary target is to provide understanding and expertise in creating that programs that positively impact the various health conditions of the population at hand. They build the skills in their students to assist them in converting theories and evidence into thoughtful, thorough systems that improve the consistent delivery of health and wellness conditions to the public. University of West Florida – Master of Public Health in Social and Behavioral Sciences – Addresses the need for professionals to satisfy the expected upcoming increase in retirements from the baby boom generation. This online graduate degree program requires as internship, supervised by a public health professionals. In addition, a proctored final comprehensive exam is required for final degree completion. The MPH degree will be what constitutes the core courses that make up the curriculum. The basic courses required of all students will cover biostatistics, environmental health, epidemiology, management sciences, public health biology, problem solving, and social and behavioral sciences. Each school will have options that can be chosen from within each of these areas, but the core will be from each of these topics. Each student can make selections in each category in order to better tailor their education to their individual interests and aspirations. In addition to these categories of courses, they require a capstone experience that aims to provide a way for the student to apply their new found expertise in a project before graduation. 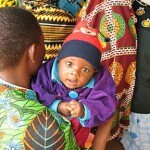 design and maintenance of policies and services to meet community and individual needs for physical and mental health. 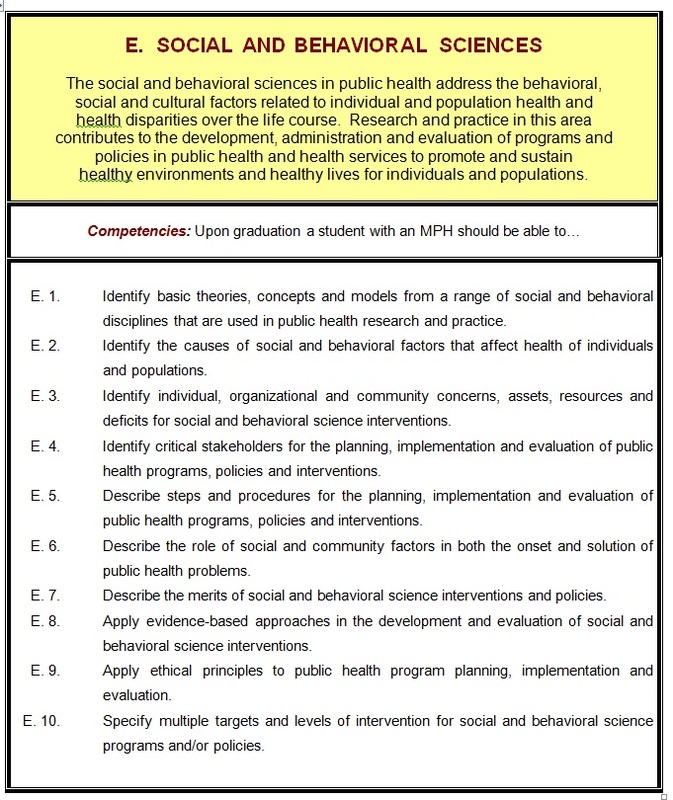 When successfully completing and graduating from a program with a Master of Public Health in Social and Behavioral Sciences, the above two lists of competencies would be all knowledge that will have been acquired. More specifically, these foundational skills will be applied in analysis on the public health in a variety of ways. The health and wellness of the population will be studied through influences of health, designing interventions, and evaluation of programs created. The research conducted will aid in determining whether or not the designs gave proper weight and credence to the elements considered for the influences. A.J. Harris II Interdisciplinary Studies Scholarship – Awarded to students doing field work in social and behavioral sciences. Consideration will be given to scholastic achievement as well as financial need. Any economically-disadvantaged students that may have worked through college in order to finance their degree will be shown preference. Russell Sage Foundation Visiting Scholars Program – As part of their foundation objectives, they have a center where scholars are invited to their location in New York to conduct writing and research on topics of social and behavioral science, many of them work collaboratively on topics of particular interest to the foundation and their mission. Albert Brigance Scholarship-Behavioral Science Major – This annual scholarship is considered for students studying in the Education and Behavioral Science Department at Southeastern Oklahoma State University. It is renewable and requires a GPA of at least 2.50. Social and Behavioral Science Scholarship – This scholarship is granted to students who meet qualifying requirements. Must be in the top ½ of their class and complete a 2 page essay with personal insight into their field of study, behavioral science. Regents Scholar Scholarship-Behavioral Science – Available to Oklahoma residents who are Oklahoma Academic Scholars. The scholarship includes a tuition waiver for four years and includes a cash award from the National Scholars office. In addition, several scholar benefits apply to these students on campus. President’s Leadership Class Tuition Waiver Scholarship-Behavioral Science – University of Montana’s Davidson Honors College provides this premier academic scholarship to outstanding incoming students. It is renewable for four years, with about 24 awarded each year. Epilepsy Foundation Behavioral Sciences Student Fellowship – Encourages students to make the condition of epilepsy part of their career aspirations, either in practice or in research. Eligible students can be from undergraduate or graduate level education. M.L. Neasham Scholarship – Eligible students must be studying psychology or behavioral science program at the American River College. Applicants born in China will be given preference, as well as students interested in promoting the culture of Asian American people. Center for Advanced Study in the Behavioral Sciences at Stanford University Fellowship – As an educated professional in behavioral sciences, these fellows are given the year term to challenge themselves to work at studying and investigating an area of particular interest to them. National Institute of Health Grant – Provides funding for advanced research into the ways people can find to reduce the incidence of illness while improving their health, which is the main mission of the National Institute of Health. The Journal of Applied Behavioral Science – This international journal is a leading source of information on the effects of evolutionary and planned change. They are looking for new developments in many different formats of how individual behavior changes given different social settings and group situations. The Journal of Social, Behavioral, and Health Sciences – This online journal is designed to provide the feedback of fellow professionals through peer review, and addresses many of the current factors that are affecting research in both national and international scope. Their primary motivation is to inspire dialog and collaboration within the global pool of public health leaders. Procedia – Social and Behavioral Sciences – Open access online system designed to publish information on a large scale basis that applies to the whole network of social and behavioral science professionals across the globe. These sources of information come from conferences, lectures, research papers, study findings, and make them available for peer review. Integrative Psychological and Behavioral Science – Explores the methods for which study is conducted into the human social condition, and to examine the interactions between people and their societies. Seeks to join many fragmented fields into a new universal social science. Journal of Behavioral & Social Science Issues – Provides a direct and immediate location to publish relevant research on all aspects of these studies. The entries are monitored and critiqued for quality and relevance to the interests of the readers. Theories and Biological Basis of Substance Use & Addiction – This 2-part course covers relevant thinking behind the study of addiction. It is comprised of 14 weeks of courses in part 1, and includes videos, notes, and activities in order to fully deliver the full classroom knowledge. Ethical Challenges in Public Health Interventions: Catastrophic and Routine – This approximately 96 minute lecture involves an actual college course from University of California at Berkeley, and instructs on many contemporary research findings on this behavioral study. 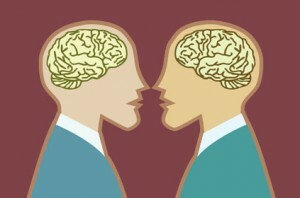 Social Psychology: Self and Society – This series of 34 lectures in an audio format. They are from a course taught at University of California at Berkeley in the Sociology department. 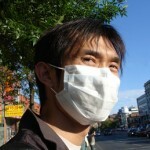 The History of Public Health – This complete course involves lecture materials and readings. It is provided by Johns Hopkins University and provides a full background explanation of the process our populations have gone through in the development of health and illness. Issues in Mental Health Research in Developing Countries – This full course also includes lecture materials, readings, and assignments from the college classroom in order to fully experience that setting. The global health research is very applicable to the study of social and behavioral sciences, which tend to be dramatically different in developing countries. SEE ALSO: Online Free Public Health Courses + Certificate Options!